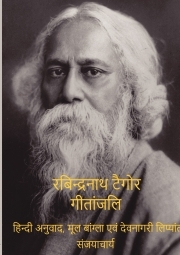 Description of "Rabindranath Tagore Gitanjali (Bangla, Devanagari, Hindi)"
Gitanjali is the best gift to mankind from Gurudev Rabindranath Tagore. Gitanjali is an answer to the questions that every mind asks and doubts buried deep in every heart. Gurudev discovers truth in nature and then presents it in form of a book. Gitanjali has power to convert a non-believer into devout believer. It is a must read for all of us. Gitanjali was written in Bengali and then Gurudev himself translated it into English. He won the Nobel Prize for same in 1913. Since then Gitanjali is translated in all major languages of the world. In this simple translation of Gitanjali, no attempt is made to interpret the meaning, however each song is translated in simple Hindi so that readers can enjoy the unadulterated joy of their own reading of the Gitanjali. This translation is available without Bengali and Devenagari text. An engineer by profession, Sanjayacharya loves languages, literature and philosophy. An eternal learner with special interests in Hindi literature and Urdu poetry. Writes books to share his learning experiences and ideas with the world. Reviews of "Rabindranath Tagore Gitanjali (Bangla, Devanagari, Hindi)"